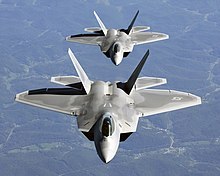 Fighter aircraft are small military planes that are made to fight other airplanes. They are often fast, having aerodynamic shapes (shapes that make them move through air easily) and very powerful engines for their size. They also usually are maneuverable (turn well). Fighters can carry many different kinds of weapons, including missiles, machine guns, and bombs. While fighters may be used as attack aircraft to attack vehicles, soldiers, or buildings on the ground, they are different from bombers because they are mainly designed to attack other airplanes. Wikimedia Commons has media related to Fighter aircraft.